Once, driving back from Guatemala through Chinkultic and Comitán, I stopped to deliver some tea in San Cristobal de las Casas. The recipient was Gertrude Duby Blom, doyenne of Na Bolom, the celebrated research center and hostel founded by Trudy and her late husband, anthropologist Frans Blom. The sender was John Armstrong, who owned a finca on the rainy slopes of San Pedro Volcano -- not far from Lake Atitlán if you're a bird -- and who, inspirationally, had abandoned raising coffee in favor of tea. His was the first finca in Guatemala to do so and the venture was quite successful and the product well respected. Those who visited Na Bolom in the seventies and eighties may recall that in her declining years, Trudy (long dead, would deny that she ever had a declining year) was protected by a coven of harpies, all stringy-haired graduate students from the Ivy League. When I presented myself at the door, I was accosted by a particularly belligerent proto-ethnologist who did not ask but demanded to know my business. I presented John's card and after a few moments was allowed to pass the shrew with the withering frown to offer freshly harvested tea to the mistress of the house. Before I could even open my mouth in greeting Trudy asked, "Are those dishes still on John's wall?" 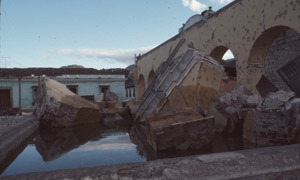 Three years previous, in 1976, I had spent the month of February exploring the aftermath of a massive earthquake that left Guatemala devastated. Despite the horrors that I encountered in the city and all through the highlands and the Motagua River valley, it was really a stunning experience. I saw, and could immediately understand, the seismic resistance of well-built adobe structures and their lesser brethren built of concrete block. Admittedly, many adobe buildings collapsed as well, but practically to a structure those were of recent vintage and the builders had abandoned the local knowledge that led to solid homes. On my way out I stopped to see John in his elegant home in the city. We had drinks and a pleasant lunch with his Honduran mother and spent most of an afternoon visiting about my uncle, who had been a close friend, and about buildings and earthquakes. I related some of my observations, with which he mostly agreed. Before going to John's, I had visited other friends in Antigua and the city and most if not all had taken their collectables and crockery off the shelves and stacked them on the floor to protect from after-shocks. I noted that John's home, though severely cracked and cockeyed, was still fully decorated, including a nice collection of bone china hanging on the dining room wall. When I observed that he must be confident the shaking was all over, he responded that no, it never was, but he didn't like the inconvenience of dismantling and re-shelving. "When I feel movement," he said, "I just look around and if anything is falling I go touch it one last time." With that he had a bite of toast laden with a lovely marmalade made from the fruit of a Seville orange tree in his courtyard. Here, I thought, is a man not overly attached to his possessions and decidedly phlegmatic about acts of God. The plates, three years later, were in situ, and John wryly noted that not only was the china still there, so was Guatemala. As it happened, Trudy Blom, years earlier and under similar circumstances, had heard John make the same offhand commentary. She clearly disapproved, wanting always to be in control even of earthquakes (she had a peculiar pronunciation that sounded like "earth-quackies"), and I got the impression that she kind of wanted to hear that the shaking highlands had prevailed and the china lay in many multifarious fragments on the tile floor. But she sighed and was content to know that John himself was fine, after all. And she offered me a cup of his tea.